The thinning or thinning hair, gives the hair volume and fluffiness, natural and smooth lines. To run can regular thinning scissors, thinning razors, but most often used for this thinning shears, unilateral or bilateral. Thinning do on clean, dry hair. If you want to give volume to the crown or bangs, separate vertical strands and mill them from the bottom up. Lower short hair up top. If you need to upper the hair close to the head, mill the vertical strands allocated from the top down. The thinning can be horizontal and vertical. When the horizontal strand of hair is stretched and cut part of it down (no more than 3-5 mm) from the ends. During vertical thinning strand is deflected in the direction approximately 30 degrees and thinning scissors are kept vertical, blade down. When cutting out the roots of a lock of shorn stretched across in several stages: first, at the base of the hair, then around the middle, and the last one towards the end of the strands. This will allow you to get the bounce of the hair at the roots. There is also such a technique as a sliding cut – while the disclosed scissors grasping the strand in the middle and move towards the ends of your hair. With the help of this technique, different length cut with thin strands. Performing a sliding cut requires special care, otherwise you run the risk of partially or completely cut off the strand. When thinning is necessary to consider the type of hair, the thickness and manageability. Thin rough sparse hair not heliroute, as well as the hair is subjected to treatment with gidroperita or a chemical wave. Hard hair after thinning out can stick out in different directions, and thick and soft, in contrast, require a deep thinning out, this will give the hairstyle additional ease. Usually the thinning is done after shearing. Hair cut thinning shears allows you to cut more rounded and lush, smooth out small bumps, but requires a sense of proportion and accuracy. If you are a hairdresser, a lover, a pair of scissors for you is the "two rings, two ends and a stud in the middle." But the professional very scrupulously approaches to selection of tool for the job. How to choose hairdressing scissors? Always choose from several models. Hold the scissors in hand, try them in motion. Carefully, not in a hurry, pick the option that suits your features and personality. Ideally, when buying a good to try scissors something to cut. Pay attention to how you conveniently control the scissors. The tool should not cause discomfort. Remember to keep the scissors will need a whole day. Sometimes, for convenience, use a pair of scissors are equipped with special inserts for rings. This allows not only to decrease or increase the diameter of the holes, but also to avoid skin contact with metal and professional blisters. 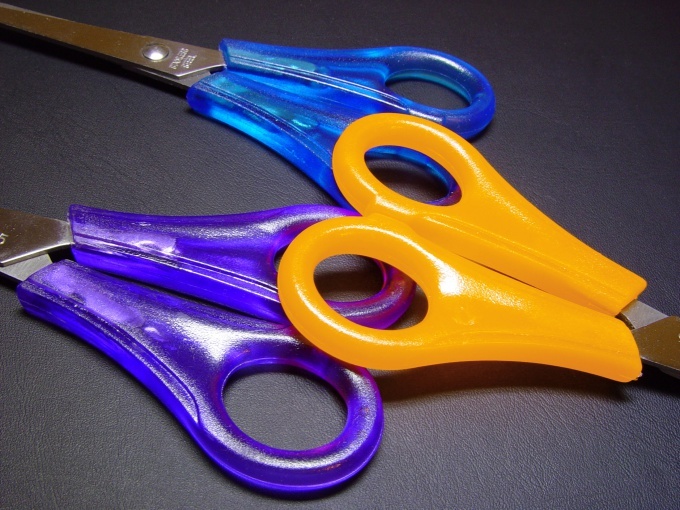 The handles of the scissors can be different: classical or asymmetrical shape. Offset rings help to relieve muscle tension in the fingers when performing certain types of work. Pay attention to the power and smoothness with which open and close the scissors. It is important that the tool did a quality cut, not eating hair. Well, if the center there is an adjustable screw. Is configured, the scissors will be fixed in any position of disclosure, which will stop their master. Examine the material from which made the tool. The harder the steel, the longer the service life of the scissors. The addition of chromium and Nickel helps prevent rust. Vanadium and molybdenum added for durability and strength. Chrome and titanium coating provides hypoallergenic. The use of silver and gold is of a decorative nature. Determine what types of work you acquire the tool. Universal scissors allow you to do the technique of sliding slice them smooth fabric. Thinning shears can be with teeth of different widths, allow you to create speed and thick hair. Tool for direct shear is manufactured mironositskoy that the hair does not slip on the canvas. Pay attention to the design and cost of the scissors. A professional tool can not be cheap. Sometimes, however, you need to understand that the cost may be increased due to the aesthetic component of the shear. The average price of a professional instrument ranges from 2000 to 5000 rubles. The most important tool of a hairdresser is a scissors. It is very important to choose a high quality and meet the needs of the professional tool. Professional hairdressing scissors made from steel grades with a hardness level of 58 HRC to 62 HRC on the Rockwell scale. The harder the steel, the longer the tool. No matter who gets the scissors, the master Barber professional or Amateur, both now have the opportunity to choose quality scissors for her craft. Such scissors can only be purchased in specialized shops, where the model is known and proven producers. By the way many (including European masters) believed that Japanese steel is the best material for the manufacture of professional hairdressing scissors.